BSC offers a complete range of security cage solutions for protecting inventory and other items in storage, increasing safety in work areas, and preventing losses. Our flexible, modular designs allow us to provide solutions that fit your needs precisely, and they can be reconfigured or relocated if your requirements change. Our wire mesh security cages and partitions are strong, secure, and durable. We offer two types of wire mesh: Woven wire and welded wire. Both products are ideal for securing entire areas and items, keeping inventory safe, and ensuring that only authorized personnel can access protected areas. Some differences make each product more suitable for specific applications. Our security cages and partitions constructed of woven wire are ideal for heavy-duty applications, and they offer high-security protection. Our heavy-gauge woven wire exceeds DEA and other regulatory requirements for secure applications. The assembly hardware is more substantial and is inaccessible from the exterior of a security enclosure, reducing the likelihood of unauthorized access. Woven wire partitions are ideal for building security cages and secured storage enclosures. Our welded wire partitions are lighter weight than our woven wire, but they still offer excellent security and durability and are suitable for most applications. Welded wire is easier to cut on site, allowing for custom openings and additions to the security structure. Welded wire partitions are typically less expensive than woven wire, and tend to be more rust-resistant, making them ideal for damp environments or for structures that may be exposed to the elements. Our heavy-duty partitions are much stronger and more secure than fencing, and unlike chain-link, they cannot be easily cut with bolt cutters. Woven and welded wire panels also do not offer easy footholds, so they are difficult to climb. Chain link fencing is more challenging to install. Wire mesh partitions can be easily relocated and reconfigured, but chain-link fencing is a permanently installed fixture, and any damage or changes to your needs means starting over with new fencing. If a wire mesh panel is damaged, it can be removed and replaced with a new panel. The initial cost of wire mesh security cage is higher than fencing, but over the lifetime of the product, it will prove less expensive because of its durability and flexibility of use. Our wire mesh secure storage products are the industry standard for customization and expansion. At BSC, we realize that one size does will not fit every application. We want to create the perfect security solution for you, so we offer a variety of options including welded wire, woven wire, metal expansion systems, custom doors, and special locks. Our wire mesh panels are modular, allowing us to create the ideal solution for your current needs and to make future changes to the layout much more manageable. Our modular wire partition systems are specially engineered for versatility and customization for various heights and bay sizes within warehouses. We know that security and durability are critical, but the appearance of your secure storage solutions is also important. We create custom designs that match your environment and roof lines, and we have a wide range of color options. Our products feature polyester powder-coated paint to keep your investment looking new for years to come. 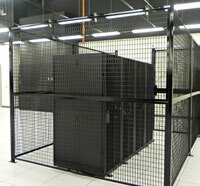 Our security cage solutions are ideal for a wide variety of applications and environments. 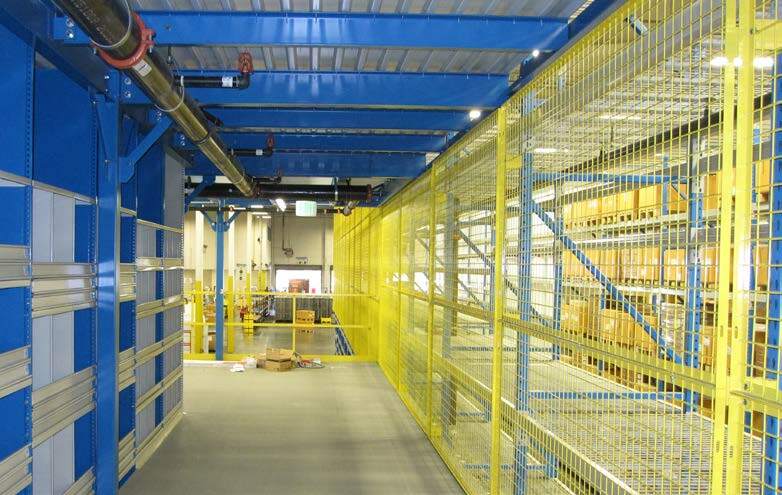 Manufacturing facilities, warehouses, distribution centers and other large facilities that need to limit access to specific areas, inventory, or tools use our wire mesh partitions to create tool cribs, robotic guarding, machine guarding, maintenance cages, separate work areas, and secure shelving and storage areas. Our partitions are ideal for creating secure waiting areas for truck drivers and visitors where access to a manufacturing or warehouse facility must be controlled, allowing security checks and admittance only by authorized personnel. Security cages do not require modification of a facility’s lighting, HVAC, or fire systems. Wire mesh partitions are also ideal for retail use, medical facilities, and secured drug and pharmaceutical storage, to control access with storage cages while keeping inventory in sight. Wire security partitions are also utilized in data centers, server areas, and other spaces with vulnerable and expensive technology that requires access control or separation. We also offer specific applications for tool storage, rack backing, tenant storage lockers, readiness storage lockers, portable storage lockers, and many more. We have a security solution that will meet your needs. Our flexible, modular security cage solutions are designed to last, to save you time, and to work within your budget. Ask us about our shipping options and products that can be installed in a matter of days. Please contact us for your quote or to discuss your specific requirements. Our products offer unlimited, flexible solutions to protect inventory and increase safety in your facility.